Personal Information is gathered by Victory Coffees for the sole benefit of Victory Coffees. Victory Coffees does not sell, rent or provide your "Personal Information" to third parties, except as described below. Personal Information as used herein refers to data and facts about you which include, but are not limited to, your name, age, address, email address, financial information (account or credit card numbers), income level, phone number, etc. Personal Information is personal to you in that it belongs to you and identifies who you are. There are a variety of pathways, electronic and otherwise, by which any single element of these data can point to you personally. Personal Information does NOT include your IP Address as defined below. Personal Information is generally kept for Victory Coffees business which is primarily used to assist you in your current or future communications and/or transactions or in analyzing sales trends with Victory Coffees. 1.1 - WHAT DO WE DO WITH YOUR INFORMATION? When you purchase something from our on-line store, as part of the buying and selling process, we collect the personal information you give us such as your name, address and email address. When you browse our store, we also automatically receive your computer's internet protocol (IP) address in order to provide us with information that helps us learn about your browser and operating system. Email marketing (if applicable): With your permission, we may send you emails about our store, new products and other updates. Personal Information is primarily obtained from a form required to be completed when customers request information, products or services, including subscribing to our Victory Coffees Newsletter. Personal Information that is collected by Victory Coffees is used to bill you for products and services, and to ship those products to you. Personal Information is used to send orders, information about our company, and promotional material to our customers. Personal Information is also used to get in touch with the customer when necessary. Users may opt-out of receiving future mailings by following the directions in those mailings. Victory Coffees may use online surveys which ask visitors for Personal Information which usually includes contact information (typically the customer's email address) and demographic information (like their zip code, age, or income level). We would potentially use Personal Information gathered from such surveys to send the user promotional material from Victory Coffees. 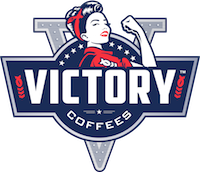 Victory Coffees may also run promotions on our site in which we ask visitors for selected Personal Information such as contact information (typically the customer's email address) and demographic information (like their zip code, age, or income level). We would potentially use Personal Information gathered from such promotional events to send users promotional material from Victory Coffees. The customer's Personal Information is also used to contact the visitor when necessary (i.e. when someone wins a contest.). Demographic and profile data is also collected at our site. We use this data to tailor our visitor's experience at our site, showing them content that we think they might be interested in, and displaying the content according to their preferences. We may disclose your personal information if we are required by law to do so or if you violate our Terms of Service. When you provide us with personal information to complete a transaction, verify your credit card, place an order, arrange for a delivery or return a purchase, we imply that you consent to our collecting it and using it for that specific reason only. If we ask for your personal information for a secondary reason, like marketing, we will either ask you directly for your expressed consent, or provide you with an opportunity to say no. By using this site, you represent that you are at least the age of majority in your state or province of residence, or that you are the age of majority in your state or province of residence and you have given us your consent to allow any of your minor dependents to use this site. Our store is hosted on Cratejoy Inc. They provide us with the online e-commerce platform that allows us to sell our products and services to you. Your data is stored through Cratejoy's data storage, databases and the general Cratejoy application. They store your data on a secure server behind a firewall. For more insight, you may also want to read Cratejoy's Terms of Service here or Privacy Statement on their website. All payments go through AUTHORIZE.NET, Inc. If you choose a direct payment gateway to complete your purchase, then AUTHORIZE.NET stores your credit card data. It is encrypted through the Payment Card Industry Data Security Standard (PCI-DSS). Your purchase transaction data is stored only as long as is necessary to complete your purchase transaction. After that is complete, your purchase transaction information is deleted. To protect your personal information, we take reasonable precautions and follow industry best practices to make sure it is not inappropriately lost, misused, accessed, disclosed, altered or destroyed. If you provide us with your credit card information, the information is encrypted using secure socket layer technology (SSL) and stored with a AES-256 encryption. Although no method of transmission over the Internet or electronic storage is 100% secure, we follow all CI-DSS requirements and implement additional generally accepted industry standards. Victory Coffees may monetize or otherwise provide anonymous IP Addresses to third parties. Victory Coffees sometimes employs other companies and individuals to perform functions on our behalf. Examples of such may include hosting our website, providing marketing assistance, providing search results and links, retargeted advertising, analyzing data, etc. These third parties have access only to IP Addresses; no Personal Information is provided to them. _session_id, unique token, sessional, Allows Cratejoy to store information about your session (referrer, landing page, etc). _Cratejoy_uniq, no data held, expires midnight (relative to the visitor) of the next day, Counts the number of visits to a store by a single customer. This site contains links to other sites. Victory Coffees is not responsible for the privacy practices or the content of such Websites. When you click on links on our store, they may direct you away from our site. We are not responsible for the privacy practices of other sites and encourage you to read their privacy statements. Our store uses Google Analytics to help us learn about who visits our site and what pages are being looked at. Victory Coffees DOES NOT ENDORSE THE USER CONTENT, IS NOT RESPONSIBLE FOR THE USER CONTENT AND SPECIFICALLY DISCLAIMS ANY RESPONSIBILITY OR LIABILITY TO ANY PERSON OR ENTITY (INCLUDING, WITHOUT LIMITATION, PERSONS WHO MAY USE OR RELY ON SUCH USER CONTENT) FOR ANY LOSS, DAMAGE (WHETHER ACTUAL, CONSEQUENTIAL, PUNITIVE OR OTHERWISE), INJURY, CLAIM, LIABILITY OR OTHER CAUSE OF ANY KIND OR CHARACTER BASED UPON OR RESULTING FROM ANY USER CONTENT PROVIDED THROUGH THIS WEB SITE.